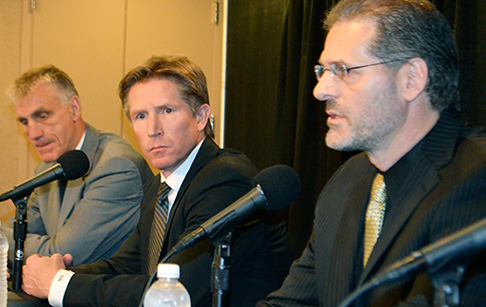 Flyers general manager Ron Hextall announced that the club will retain assistant coaches Gord Murphy, Ian Laperriere and Joe Mullen, who will join head coach Dave Hakstol, who was hired on May 18. Murphy, 48, enters his second season as assistant coach with the Flyers after being named to the position on June 18, 2014. He will also begin his 13th season as an NHL assistant coach, previously serving in that role with the Florida Panthers (2010-13) and Columbus Blue Jackets (2002-10), after appearing in 862 games in the NHL as a defenseman. He recorded 85 goals and 238 assists for 323 points and 668 penalty minutes in parts of 14 NHL seasons with the Flyers, Boston, Florida and Atlanta. He was drafted by the Flyers in the 9th round (189th overall) of the 1985 NHL Entry Draft. Laperriere, 41, enters his third season as assistant coach with the Flyers after being named to the post on Oct. 7, 2013. He spent the 2009-10 season with the Flyers as a player, helping the team reach the Stanley Cup Final, and an additional two seasons in player development while trying to return from the aftereffects of an injury suffered in the first round of the 2010 playoffs. Following the 2010-11 season, Laperriere won the Bill Masterton Memorial Trophy for his perseverance, sportsmanship, and dedication to hockey. Over his 16 year NHL career, Laperriere played 1,083 games with the Flyers, St. Louis, NY Rangers, Los Angeles, and Colorado, finishing his career with 1,956 PIM – the career leader among active NHL players at the time of his retirement. He was originally selected by St. Louis in the seventh round (156th overall) of the 1992 NHL Entry Draft. Mullen, 58, enters his ninth season with the Flyers as assistant coach after being named on June 6, 2007. Mullen and the Flyers had the NHL’s third-best power play at 23.4 percent and tied for second in the NHL in power-play goals scored (60), while owning the league’s best power play at home, operating at 28.0 percent, going 37-for-132. During his tenure, the Flyers have been in the Top 5 on the power play in five of the last eight years, and Top 10 on the man advantage in seven of his eight years. Mullen played 17 seasons in the NHL with St. Louis, Calgary, Pittsburgh and Boston recording 502 goals and 561 assists for 1,063 points and 241 penalty minutes in 1,062 regular season games. His 502 goals are fourth all-time among U.S.-born players. He was a member of three Stanley Cup Championship teams, with Calgary in 1989 and Pittsburgh in 1991 and 1992. He won the NHL’s Lady Byng Trophy as “the player adjudged to have exhibited the best type of sportsmanship and gentlemanly conduct combined with a high standard of playing ability” twice (1987 and 1989), as well as the Lester Patrick Trophy “for outstanding service to hockey in the United States.” in 1995. He was inducted into the Hockey Hall of Fame in his first year of eligibility in 2000, two years after his induction into the United States Hockey Hall of Fame (1998).